It’s really starting to become more real. I’m excited and scared all at once. Trying to nail down all of the things we need to take with us (but not too much)… ah…balance…. Graduation in Hawai`i truly is an experience like no other. 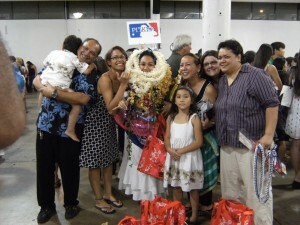 On this very special day, the graduate is surrounded by the pride and aloha of their family. They are bestowed material evidence of this love in the form lei. 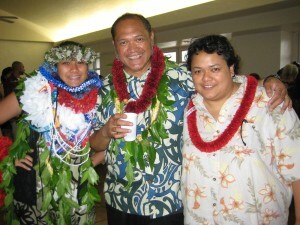 The lei can be made from fresh flowers, candy, and even money. Once graduated, they are surrounded and enveloped by it. The ubiquitous graduation party follows shortly thereafter and ours was no different. Friends and `ohana filled the Kapolei Recreation Center – laughter, dancing, and aloha packed the room. Everyone enjoyed the ono Hawaiian food and, as Maylene puts it, the generic island beer – Heineken. Everyone should have a graduation experience like this!